Here is a tutorial on how to setup your Gmail account in Microsoft Office 2013. These instructions will also work for Outlook 2007, 2010, and Outlook Preview 2016. I created the video below on how to setup your Gmail account as POP3 in Outlook 2013. However, if you would rather follow text instructions you will find them below. Before we open Outlook lets visit your Gmail account. 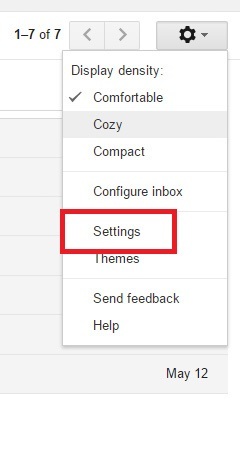 Log into your Gmail and go the gear in the right corner and select Settings. This entry was posted in Tips and tagged Gmail, Microsoft Outlook, Outlook 2013, Pop3 on June 15, 2015 by Merlin Halteman. Update 6/30/2017: If the below solution doesn’t work. Check out this updated post on my blog. A customer was receiving this error message in Outlook 2007 the other day. 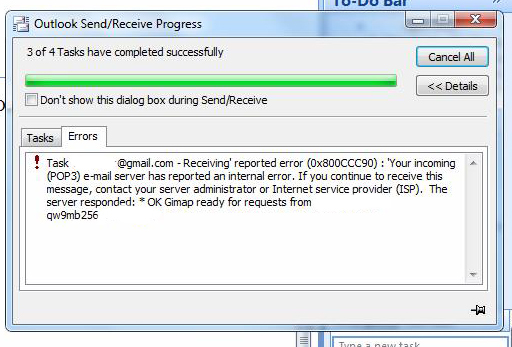 ” Task “[email protected]” – Receiving reported error (0x800CCC90) : ‘Your incoming (POP3) e-mail server has reported an internal error. If you continue to receive this message, contact your server administrator or Internet service provider (ISP). The server responded: * OK Gimap ready for requests from (IP Address). The customer was using a Gmail address in Outlook. The account was set up as POP3. I wasn’t sure what the fix for this big error code was going to be. It is actually quite simple. Step Two: Click the email account you are having trouble with and select Change. This entry was posted in Troubleshooting and tagged 0x800CCC90, Gmail, Microsoft Outlook, Pop3 on April 17, 2015 by Merlin Halteman. I recently upgraded a user from a standard Pop3 email account to a Microsoft Exchange Office 365 email account. The upgrade went great and all the email was transferred, but the user complained about their auto-complete email contacts were not showing up when they typed a contact’s email address in the “send” field. This user was running Windows 7 and was using Outlook 2010. Here are the steps to retrieve the auto-complete file and use it in the new profile. This entry was posted in Troubleshooting and tagged Autocomplete, Email, Office 365, Outlook, Pop3 on August 14, 2013 by Merlin Halteman.